Marcus Allen's career places him in the discussion of the best running backs of the 1980s and his historic longevity continued well into the next decade. 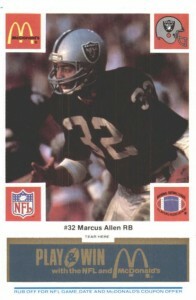 This top list of the best Marcus Allen football cards covers his college and NFL playing days as well as cards from more recent releases. 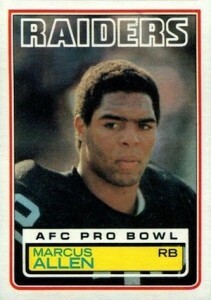 Shop for Professionally Graded Marcus Allen Cards on eBay. Allen was born in the south part of California and it seemed that he was destined to play football for the University of Southern California. While he was part of the 1978 USC national championship team, Allen reached superstar status during his senior year as he won the 1981 Heisman Trophy along with nearly every other award. That season he became the first college running back to surpass 2,000 yards rushing and he still shares the record for most career 200-yard rushing games with 12. 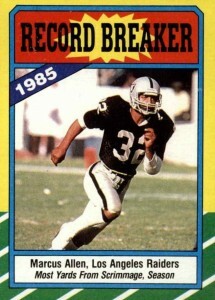 The Los Angeles Raiders drafted Marcus Allen with the tenth pick in the 1982 NFL Draft and he had an explosive debut season as he led the league in rushing touchdowns and was named the 1982 Rookie of the Year. The following season saw the Raiders win Super Bowl XVIII with Allen rushing for 191 yards on his way to being named the game's MVP. Allen's peak statistical season was in 1985 when he rushed for over 1,700 yards and 14 total touchdowns. His lengthy career also saw him set NFL records as the player with the most seasons with multiple touchdowns at 16. 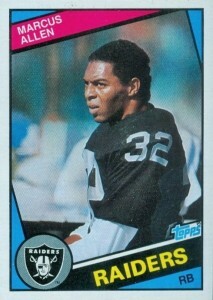 Outside of the cards on this list, there are a few other Marcus Allen cards that are worth noting. Although a Marcus Allen and Bo Jackson pairing appears below, 1989 Score has a great combo card of the two elite Raider running backs. 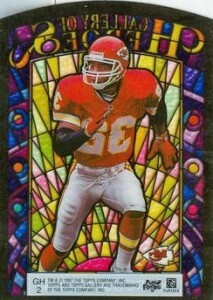 Allen was also a teammate with Joe Montana as they both played for the Kansas City Chiefs. You can find combo cards for the two Hall of Famers in several sets, including 1994 Pro Set, 2005 Donruss Classics, and 2005 Leaf Limited. Certainly his oddest card can be found in 1991 Pinnacle and it highlights his mastery of the piano. In building this list, the focus was on compiling a comprehensive cardboard overview, including entries honoring both his college career and his time playing for the Raiders and Chiefs, with card value being a major determining factor. Although Allen became a star during his Heisman Trophy season in 1981, he was a part of the University of Southern California's title team in 1978 as a freshman. He also shared the backfield with another Heisman Trophy winner, Charles White, who had won the award two seasons before Allen. 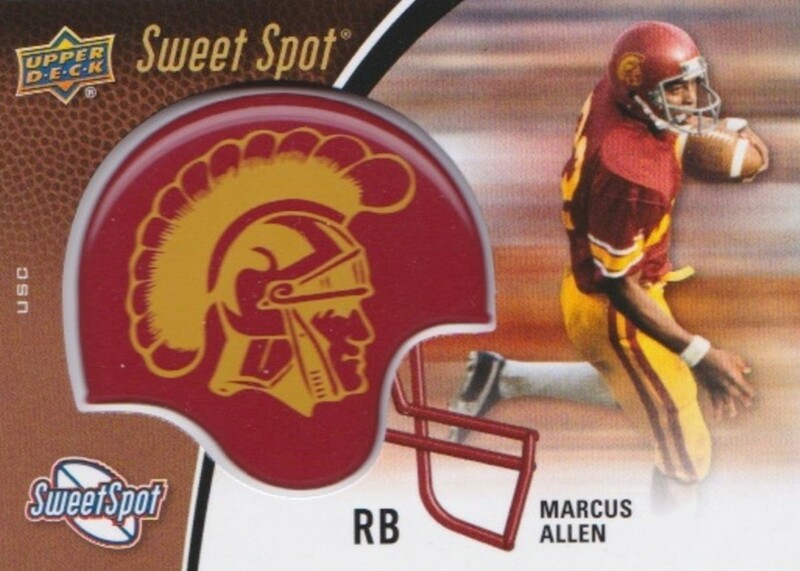 Fans of the Trojans should investigate these mini helmet cards included in 2015 Upper Deck Sweet Spot which come in both home and away helmets. Allen was chosen as the leadoff card in the 1986 Topps set and his Record Breaker subset honors the amazing season Allen had in 1985. Along with being selected the league's Most Valuable Player, he set the record for most yards from scrimmage with an amazing total of 2,314. His base card also maintains decent interest and is quite distinct given the striped design. 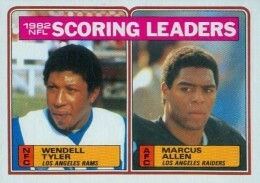 Along with his official rookie from 1983 Topps (more on that later), Marcus Allen also made several other rookie-year appearances in 1983 Topps products that collectors should consider adding to their collections. 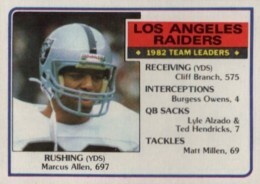 Allen scored 11 rushing touchdowns and three receiving scores to lead the league in 1982 and he is featured on the Scoring Leaders subset as well as the Raiders Team Leaders card. He was also selected #1 in the 1983 Topps Stickers checklist and the card features a beautiful shot of Allen in the middle of a long run. 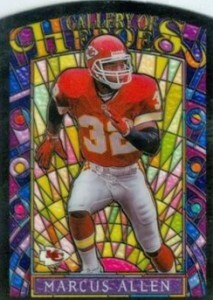 Allen played all the way through the end of the 1997 season, giving him an impressive 16 seasons in the league and also many football cards in his honor. Certainly one of the most well-designed options is his appearance in the Gallery of Heroes insert set from 1997 Topps Gallery. The cards mimic the look of a stained glass window with the reverse side of the card serving as a mirror image of the front, giving the impression that it is transparent. 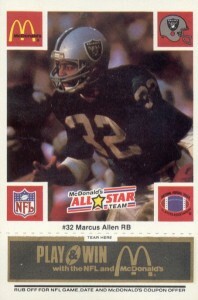 Marcus Allen was included in the famous McDonald's All-Star Team cards that were available at the fast food restaurants over the course of four weeks in 1986. Each week, a different scratch-off tab version was released and collectors can build complete sets in the four different colors that include blue, green, gold, and black. Blue is the most difficult to find as it was the color used in the contest's first week. 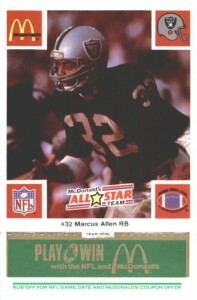 The unique all-black design of 1985 Topps naturally worked well for the cards of the Raiders players and Allen's card is no exception. The reverse side of the card reminds us that he had a stellar 1984 season, finishing second in rushing and leading the league in combined touchdowns with 18. 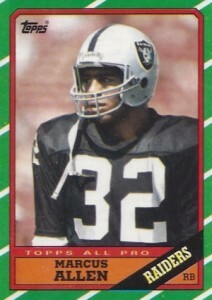 Allen and Bo Jackson were teammates during Jackson's brief NFL career and Jackson's early success would limit Allen's playing time and ultimately lead to Allen leaving the Raiders to join the Kansas City Chiefs for the 1993 season. 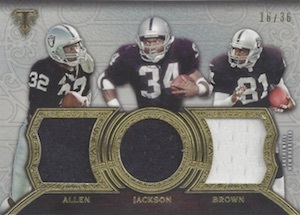 The duo are joined by legendary Raiders receiver Tim Brown on several triple relics in the 2015 Topps Triple Threads set with multiple parallels and varying degrees of rarity. 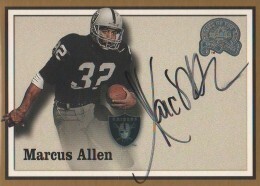 Raiders fans have many Marcus Allen signatures to choose from as he is a frequent signer in modern football products. Allen was recently included in 2015 Topps Definitive and 2014 Topps Supreme, however, the card included here is one of his first certified autographs. As seen in the 2000 Fleer Greats of the Game autograph below, Allen's autograph is famous for having the "M" in his first name look like a large star that dominates the rest of the signature. Allen catches his breath on the bench on his 1984 Topps card. He would need the break after cracking the 1,000-yard rushing mark and adding nearly 600 more yards receiving in his first full pro season following the strike-shortened 1982 year. Allen topped off the season with an MVP performance in Super Bowl XVIII against the Washington Redskins. 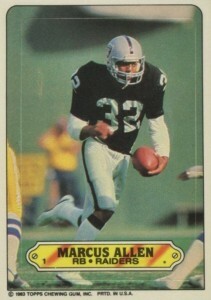 Marcus Allen debuted on a Topps football card in 1983 Topps having already earning the title of All-Pro in his strike-shortened rookie season the previous year. 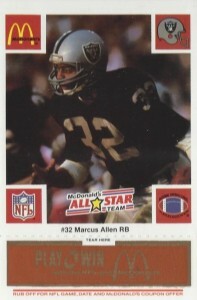 The 1983 Topps set shrank to just 396 cards and, along with Mike Singletary, the Marcus Allen rookie card holds the most value in the set with gem mint graded copies regularly toping $400 at auction. 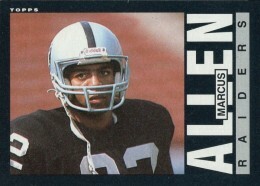 MARCUS ALLEN DUAL 2 COLOR PATCH # 45 2007 ULTRA "THE RAIDERS"
1983 Marcus Allen Topps ROOKIE Card #294! NM MT! 2015 TTT MARCUS ALLEN BO JACKSON TIM BROWN 1 1 BGS 9 9 AUTO ! !